Background and objectives: Patients undergoing total hip arthroplasty (THA) may have femoral deformities classified as either coxa vara, coxa valga, or physiologic. Understanding patients' anatomies is of importance for surgeons in an effort to tailor not only surgical approach, but also implant selection, and ultimately ensure optimal outcomes. The goal of the present study is to determine the efficacy of implanting a lower neck shaft angle (NSA) femoral stem in patients with coxa vara deformities and determine short-term clinical outcomes. Design: A retrospective chart review study. Methods: The study took place at The Texas Center for Joint Replacement in Plano, Texas. Two patient groups, clinical outcomes group and EOS group, were used for this study. The clinical outcomes group contained 55 patients who had undergone primary THA surgery from June 2013 to June 2015 by the senior author. The EOS group contained 36 patients who had undergone primary THA, and completed both preoperative and postoperative biplanar X-rays (low dose imaging device EOS) to obtain three-dimensional reconstructions of the skeletal system from October 2015 to November 2016. Operations were performed in all hips through the anterior supine intermuscular approach utilizing a 123° NSA femoral stem, which was lower than the NSA (133°) found in standard femoral stem implants. Outcome measures: Pre- and postoperative Harris hip scores used to assess clinical outcomes following surgery. 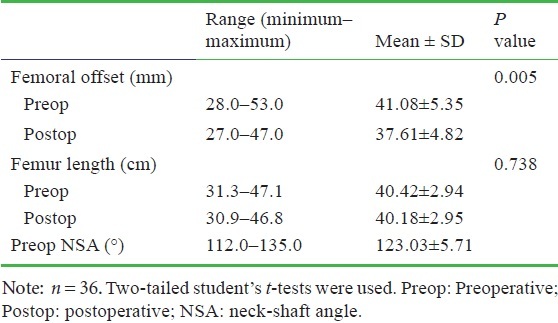 Pre- and postoperative femoral offset, NSA, and femur length determined by EOS. Results: In the EOS group, mean femoral offset decreased by 3.5 mm, from 41.08 mm preoperatively to 37.6 mm postoperatively. Mean femoral NSAs decreased by 0.02°, from 123.02° preoperatively to 123.00° postoperatively. Mean femur length decreased by 2.4mm, from 404.2 mm preoperatively to 401.8 mm postoperatively. In the clinical outcomes group, mean Harris hip scores rose from 47 preoperatively to 93 postoperatively. Hip flexion range of motion improved from 87.5° preoperatively to 98° postoperatively. Conclusion: The lower NSA femoral stem examined in this study was proven to accurately restore NSA by 0.03°, femoral offset by 3.47 mm, and femur length by 2 mm, all within clinically documented satisfactory ranges without no revisions, suggesting excellent clinical outcomes in patients with coxa vara hip deformities. THA surgeons may consider utilizing femoral stems with a lower NSA in an effort to adequately restore hip function in patients with coxa vara hip deformities. Trial registration: This is a retrospective chart review study, therefore registration was not required. Today, a wide range of femoral implants with varying NSA's are available, and lateralized variants allow for the reconstruction of the femoral offset without influencing leg length. ,, Current implants include a range of NSA options, from 123-135°. In a CT study of 800 adult hips, 5.1% of hips were categorized as coxa vara (NSA < 120°), 69.8% as physiologic (NSA > 120° to < 135°), and 25.1% as coxa valga (NSA > 135°). Although the prevalence of hips categorized as coxa vara is low in the CT study (Germany), other populations may see a higher prevalence of varus hips, such as American or Asian territories. Regardless, an alternative approach to THA in these patients should be considered in the pursuit to maximize patient satisfaction. The goal of the current study is to determine the efficacy of implanting a low NSA femoral stem in patients with coxa vara deformities and determine short-term clinical outcomes, while also utilizing the EOS three-dimensional (3D) imaging system to describe femoral anatomies both pre and postoperatively, analyzing femoral offset, leg length discrepancy, and NSA. This study received institutional review board (IRB) approval from the local institution, Texas Health Resources, on April 19, 2017, reference # Pro1617 and was carried out in accordance with Good Clinical Practices (GCP) clinical guidelines. Given the retrospective nature of the study, a waiver for informed consent was approved by the local IRB. This was a retrospective chart review study [Figure 1], therefore not needing to be registered. The study took place at The Texas Center for Joint Replacement in Plano, Texas, USA. The patient population analyzed in this study were all determined to have coxa vara hip deformities as per preoperative X-ray examination. Given the presence of a short varus neck preoperatively, the senior surgeon decided to proceed with THA utilizing a femoral stem that incorporated a 123° NSA, as opposed to the NSA of 133° found in standard femoral stem implants. The primary goals of restoring offset, equalizing leg length, and matching NSA to the native femur were all measured. All patients implanted with a 123° NSA femoral stem and had completed Harris hip scores (HHS) assessment were included in the clinical outcomes group. All patients implanted with a 123° NSA femoral stem and had completed pre- and postoperative EOS X-ray assessment were included in the EOS group. Both patient cohorts were selected in a consecutive series. The clinical outcomes group contained 55 patients who had undergone primary THA surgery from June 2013 to June 2015 by the senior author (RE). The EOS group contained 36 patients who had undergone primary THA from October 2015 to November 2016, by either RE or KE. THA was done through the anterior supine intermuscular approach while utilizing the Taperloc Complete XR 123° femoral stem (Zimmer Biomet; Warsaw, Indiana). All patients who were treated with THA were diagnosed with either osteoarthritis or avascular necrosis. All patients implanted with the Taperloc Complete XR 123° femoral stem were included in the clinical outcomes group. All patients implanted with the Taperloc Complete XR 123° femoral stem and those who completed both pre- and postoperative EOS X-rays were included into the EOS group. In all cases, the patients were placed supine on the supine hip positioning table with both legs in boots, allowing the surgeon to uniquely position the patient in an effort to replace the hip through a single incision without the detachment of muscle from the femur or pelvis. A C-arm (Ziehm Orlando, Florida, USA) was used to image the diseased hip to determine the native preoperative anteversion, leg lengths, offset, and cup abduction and anteversion. The incision was over the proximal tensor muscle belly, centered over the greater trochanter. The dissection was carried into the interval between the tensor and sartorius muscles. An L-shaped capsulotomy was performed. Retractors were placed around the femoral neck, and the head was resected in a 2-step fashion. On the femoral side, the canal was exposed by placing the leg in extension, external rotation, and adduction using the femoral lift and doing proximal posterior releasing. The canal was prepared with rasps and broaches. After trialing was completed, final components were placed accordingly with restoration of normal leg length in mind. HHS were obtained both pre- and postoperatively, the most recent clinic visit, in order to assess clinical outcomes following surgery. The HHS, a clinician based outcome measure administered by a qualified healthcare professional, was developed to assess the results of hip surgery with the intention to evaluate various hip disabilities. , The HHS score gives a maximum of 100 points, with the higher score correlating with less dysfunction; A total score of < 70 is considered a poor result; 70-80 is considered fair, 80-90 is good, and 90-100 is an excellent result. , The EOS was used to retrieve preoperative and postoperative femoral offset, NSA, and femur length [Figure 2]. Femoral offset was defined as the distance between the center of the femoral head and the orthogonal projection of this point on the proximal femoral diaphysis axis. Femur length was defined as the distance between the center of the femoral head and the center of the trochlea. NSA was defined as the angle between the femoral neck axis and the proximal diaphysis axis. Figure 2: Preoperative (left) and postoperative (right) EOS images with neck-shaft angle (NSA), femur length, and offset displayed. Two-tailed Student's t-tests were used to determine statistical significance, utilizing an alpha of 0.05. Statistical analysis and graphs were prepared using Microsoft Excel (Microsoft Corporation, Redmond, WA, USA) and IBM SPSS statistics 23 (IBM Corporation, Armonk, NY, USA). Demographics in the clinical outcomes and EOS groups are displayed in [Table 1]. Mean patient follow-up time was 14 months (1-35 months) and mean HHS follow up time was 12.4 months (5-34 months). In the EOS group, the pre- and postoperative values for femoral offset, NSA, and femur length are summarized in [Table 2]. Mean femoral offset decreased by 3.5 mm, from 41.08 mm preoperatively to 37.6 mm postoperatively. Mean NSA decreased by 0.02°, from 123.02° preoperatively to 123.00° postoperatively. Mean femur length decreased by 2.4 mm, from 404.2 mm preoperatively to 401.8 mm postoperatively. Preoperative NSA for each patient and various femoral stem NSA's available are displayed in [Figure 3]. 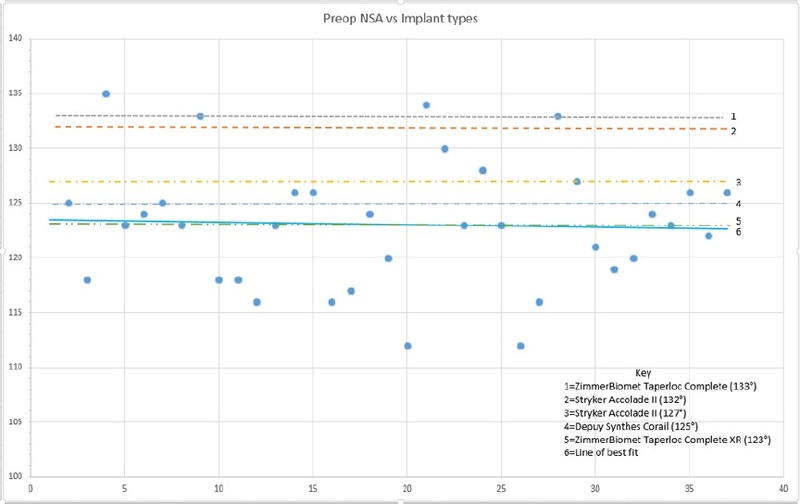 Figure 3: Scatterplot of 36 patients preoperative NSA's and various implant stem NSA's available on the market in the EOS group. Note: All data points used to create line of best fit. Linear trend line (line of best fit) is the solid line. NSA: Neck-shaft angle. In the clinical outcomes group, mean HHS rose from 47 preoperatively to 93 postoperatively [Figure 4]. 80% of patients reported excellent, 10% reported good, and 10% reported fair HHS outcomes at an average of 1 year follow-up. No revisions were reported for either the EOS group or the clinical outcomes group. Hip flexion range of motion (ROM) improved from 87.5° preoperatively to 98° postoperatively [Figure 5]. 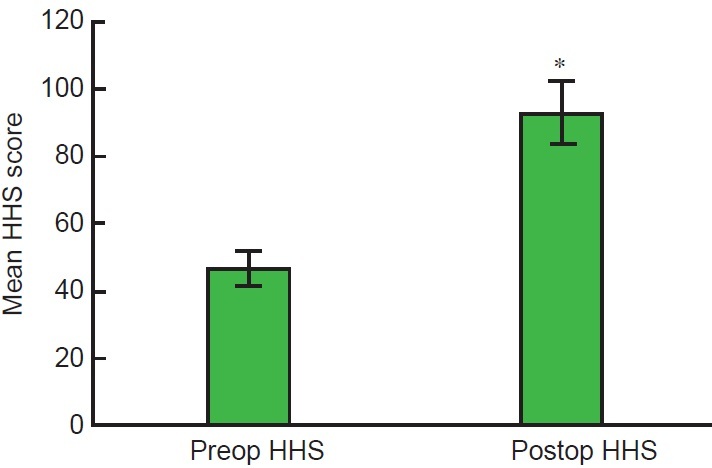 Figure 4: Mean pre- and postoperative HHS scores for patients in the clinical outcomes group at 1-year follow-up. Note: Star represents statistical significance between groups (P < 0.05; two-tailed Student's t-tests). HHS: Harris hip scores; Preop: preoperative; Postop: postoperative. Figure 5: Pre- vs. postoperative hip flexion range of motion (ROM) in degrees in the clinical outcomes group at 1-year follow-up. Note: Star represents statistical significance between preop and postop (P < 0.05; two-tailed Student's t-tests). Preop: Preoperative; Postop: postoperative. Total hip restoration has evolved drastically since its inception in 1960, with the introduction of advanced imaging capabilities and the enhancement in the variety of implants available at a surgeon's discretion. Optimizing function is contingent on restoring hip mechanics to as near normal as possible, is a generally accepted theme in the THA community. , Given the vast array of anatomies in patients, having an equally extensive range of implant options makes customizing THA for individual patients much more feasible. The 123° NSA, compared with other NSA's available in the market, most closely resembles the mean NSA observed in patients with coxa vara hip deformities. Coxa vara deformities are a challenging subgroup of THA patients, with an increased likelihood of varus stem positioning, which can contribute to limb lengthening. Mean preoperative leg length of 404.17 mm was matched to an average of 401.83 mm postoperatively, a match within 2.34 mm. Ranawat et al. reported that a leg length discrepancy should not exceed 6 mm, and others reported that leg length should be restored within 5 mm. Beard et al. found that patients with leg length difference >10 mm at follow up of up to 3 years had significantly worse Oxford hip scores. HHS at an average of 12.4 months was reported at 93, indirectly supporting the notion that minimal limb length discrepancy results in greater satisfaction. Although lengthening of the operated limb is more frequent than shortening, ,, our series does not support that notion as limb length was actually shortened for the coxa vara patient cohort, by roughly 2 mm on average. Lower limb length discrepancy may increase the risk of aseptic loosening, , gait disorders,  instability,  back pain,  may prompt revision surgery, , and is the most common reason for litigation after THA,  stressing the importance of restoring limb length with precision. The absence of revisions reported in either group provides support of correctly restoring limb length during this series. In order to preserve the same level of abductor muscle tension while continuing to preserve limb length, a lateralized stem must be used when managing coxa vara during THA. As determined per 3D imaging through the EOS system, the surgeons were successful in matching mean preoperative NSA to mean postoperative NSA within 0.02°, displaying a near perfect match to proximal femoral geometry. Failure to restore offset is also a reason for patient dissatisfaction. Average femoral offset decreased from 41.1 mm preoperatively to 37.6 mm postoperatively, resulting in a reduction of 3.5 mm in average femoral offset as measured by the EOS system. Authors conclude that femoral offset discrepancies should not exceed 5 mm, since larger values correlate with increased polyethylene wear. Sariali et al. studied the isolated effect of femoral offset after THA on gait and found that a 6 to 12 mm decrease in femoral offset after THA altered gait, lowering swing speed and reducing ROM at the knee when walking. Hip flexion ROM increased from 87.5° preoperatively to 98° postoperatively in the clinical outcomes group. Mahmood et al. measured isometric abductor muscle strength with an electronic dynamometer in 222 patients and found a reduction in offset of more than 5 mm after THA was associated with a reduction in abductor muscle strength in the operated hip. The ability to remain under the 5 mm offset difference, as compared to patient's native anatomies, displays further evidence of the practicality of using lower NSA femoral stems in patients with coxa vara hip deformities. Plotting a linear regression for all patient preoperative NSA's in the EOS group and also illustrating various femoral implant types from different manufacturers, one can easily visualize how closely the Taperloc XR 123 stem matches the line of best fit for coxa vara patients in this cohort. This figure also helps display the gap between standard implant NSA's and coxa vara hip patients. Strengths of this study are the ability to focus on preoperative and postoperative imaging, giving the ability to compare similar pre- and postoperative variables (femoral offset, NSA, and limb length). 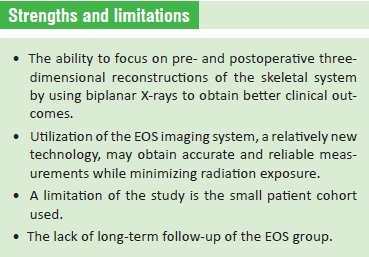 Another strength would be the utilization of the EOS imaging system, a relatively new technology which may constitute an alternative to plain radiographs for obtaining accurate and reliable measurements while minimizing radiation exposure. , A weakness of the study would be the small patient cohort used, given the uncommonness of patients with coxa vara deformities. Another weakness of the study would be the lack of long term follow-up of the EOS Group, given its recent adoption in the clinic, and having to study two groups in order to incorporate clinical outcomes and anatomic function into the study. Although there is a small patient population with coxa vara hip deformities, the variation in patient anatomies requires an array of femoral stems that can help restore patient hip function accurately. The femoral stem examined in this study, the Taperloc Complete XR 123, was proven to accurately restore NSA by 0.03°, femoral offset by 3.47 mm, and leg length by 2 mm, all within clinically documented satisfactory ranges, on average comparing preoperatively to post operation, while reporting no revisions and excellent clinical outcomes. THA surgeons concerned with accurately replicating patient native anatomies in coxa vara deformed hips should consider the use of femoral stems with a lower NSA, as a tool to help restore hip function. Boese CK, Dargel J, Jostmeier J, Eysel P, Frink M, Lechler P. Agreement between proximal femoral geometry and component design in total hip arthroplasty: implications for implant choice. J Arthroplasty. 2016;31:1842-1848. Hariri S, Chun S, Cowan JB, Bragdon C, Malchau H, Rubash HE. Range of motion in a modular femoral stem system with a variety if neck options. J Arthroplasty. 2013;28:1625-1633. Eggli S, Pisan M, Muller ME. The value of preoperative planning for total hip arthroplasty. J Bone Joint Surg Br. 1998;80:382. Shoji T, Yamasaki T, Izumi S, Hachisuka S, Ochi M. The influence of stem offset and neck shaft angles on the range of motion in total hip arthroplasty. Int Orthop. 2016;40:245-253. Massin P, Geais L, Astoin E, Simondi M, Lavaste F. The anatomic basis for the concept of lateralized femoral stems: a frontal plane radiographic study of the proximal femur. J Arthroplasty. 2000;15:93-101. Aarabi M, Rauch F, Hamdy RC, Fassier F. High prevalence of coxa vara in patients with severe osteogenesis imperfecta. J Pediatr Orthop. 2006;26:24-28. Illés T, Somoskeöy S. The EOS™ imaging system and its uses in daily orthopaedic practice. Int Orthop. 2012;36:1325-1331. Nilsdotter A, Bremander A. Measures of hip function and symptoms: Harris Hip Score (HHS), Hip Disability and Osteoarthritis Outcome Score (HOOS), Oxford Hip Score (OHS), Lequesne Index of Severity for Osteoarthritis of the Hip (LISOH), and American Academy of Orthopedic Surgeons (AAOS) Hip and Knee Questionnaire. Arthritis Care Res (Hoboken). 2011;63 Suppl 11:S200-207. Harris WH. Traumatic arthritis of the hip after dislocation and acetabular fractures: treatment by mold arthroplasty. An end-result study using a new method of result evaluation. J Bone Joint Surg Am. 1969;51:737-755. Marchetti P, Binazzi R, Vaccari V, et al. Long-term results with cementlessFitek (or Fitmore) cups. J Arthroplasty. 2005;20:730-737. Renkawitz T, Weber T, Dullien S, et al. Leg length and offset differences above 5mm after total hip arthroplasty are associated with altered gait kinematics. Gait Posture. 2016;49:196-201. Flecher X, Ollivier M, Argenson JN. Lower limb length and offset in total hip arthroplasty. Orthop Traumatol Surg Res. 2016;102(1 Suppl):S9-20. Murphy CG, Bonnin MP, Desbiolles AH, Carrillon Y, A¿t Si Selmi T. Varus will have varus; a radiological study to assess and predict varus stem placement in uncemented femoral stems. Hip Int. 2016;26:554-560. Ranawat CS, Rodriguez JA. 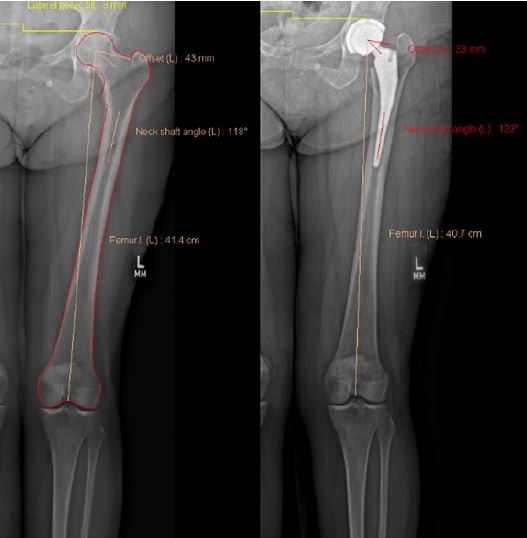 Functional leg-length inequality following total hip arthroplasty. J Arthroplasty. 1997;12:359-364. Nishio S, Fukunishi S, Fukui T, Fujihara Y, Yoshiya S. Adjustment of leg length using imageless navigation THA software without a femoral tracker. J Orthop Sci. 2011;16:171-176. Beard DJ, Palan J, Andrew JG, Nolan J, Murray DW. Incidence and effect of leg length discrepancy following total hip arthroplasty. Physiotherapy. 2008;94:91-96. Williamson JA, Reckling FW. Limb length discrepancy and related problems following total hip joint replacement. Clin Orthop. 1978:135-138. Djerf K, Wahlstrom O. Total hip replacement comparison between the McKeeFarrar and charnley prostheses in a 5-year follow-up study. Arch Orthop Trauma Surg. 1986;105:158-162. Amstutz HC, Ma SM, Jinnah RH, Mai L. Revision of aseptic loose total hip arthroplasties. Clin Orthop. 1982;170:21-33. Visuri T, Lindholm TS, Anti-Poika I, Koskenvuo M. The role of overlength of the leg in aseptic loosening after total hip arthroplasty. Ital J OrthopTraumatol. 1993;19:107-111. Rosler J, Perka C. The effect of anatomical positional relationships on kinetic parameters after total hip replacement. Int Orthop. 2000;24:23-27. Woo RY, Morrey BF. Dislocations after total hip arthroplasty. J Bone Joint Surg Am. 1982;64:1295-1306. Mihalko WM, Phillips MJ, Krackow KA. Acute sciatic and femoral neuritis following total hip arthroplasty. A case report. J Bone Joint Surg Am. 2001;83-A:589-592. Maloney WJ, Keeney JA. Leg length discrepancy after total hip arthroplasty. J Arthroplasty. 2004;19:108-110. Parvizi J, Sharkey PF, Bissett GA, Rothman RH, Hozack WJ. Surgical treatment of limb-length discrepancy following total hip arthroplasty. J Bone Joint Surg Am. 2003;85-A:2310-2317. Hofmann AA, Skrzynski MC. Leg-length inequality and nerve palsy in total hip arthroplasty: a lawyer awaits! Orthopedics. 2000;23:943-944. McGrory BJ, Morrey BF, Cahalan TD, An KN, Cabanela ME. Effect of femoral offset on range of motion and abductor muscle strength after total hip arthroplasty. J Bone Joint Surg Br. 1995;77:865-869. Little NJ, Busch CA, Gallagher JA, Rorabeck CH, Bourne RB. Acetabular polyethylene wear and acetabular inclination and femoral offset. Clin Orthop Relat Res. 2009;467:2895-2900. Sariali E, Klouche S, Mouttet A, Pascal-Moussellard H. The effect of femoral offset modification on gait after total hip arthroplasty. Acta Orthop. 2014;85:123-127. Mahmood SS, Mukka SS, Crnalic S, Wretenberg P, Sayed-Noor AS. Association between changes in global femoral offset after total hip arthroplasty and function, quality of life, and abductor muscle strength. A prospective cohort study of 222 patients. Acta Orthop. 2016;87:36-41. Anakwe RE, Jenkins PJ, Moran M. Predicting dissatisfaction after total hip arthroplasty: a study of 850 patients. J Arthtoplasty. 2011;26:209-213. Jones CA, Voaklander DC, Johnston DW, Suarez-Almazor ME. Health related quality of life outcomes after total hip and knee arthroplasties in a community based population. J Rheumatol. 2000;27:1745-1752. 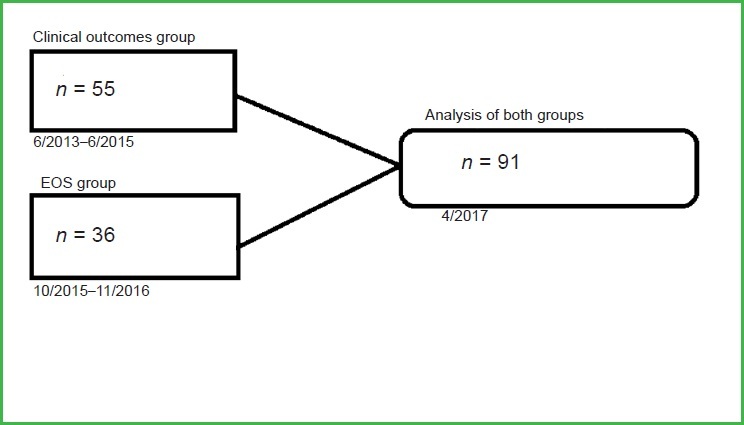 Müller M, Abdel MP, Wassilew GI, Duda G, Perka C. Do post-operative changes of neck-shaft angle and femoral component anteversion have an effect on clinical outcome following uncemented total hip arthroplasty? Bone Joint J. 2015;97-B:1615-1622. Clement ND, S Patrick-Patel R, MacDonald D, Breusch SJ. Total hip replacement: increasing femoral offset improves functional outcome. Arch Orthop Trauma Surg. 2016;136:1317-1323. Lazennec JY, Brusson A, Dominique F, Rousseau MA, Pour AE. Offset and anteversion reconstruction after cemented and uncemented total hip arthroplasty: an evaluation with the low-dose EOS system comparing two- and three-dimensional imaging. Int Orthop. 2015;39:1259-1267. We thank Texas Health Presbyterian Hospital of Plano for their support of this work. OA was responsible for creation of study design, collection and analysis of data. RE was the senior surgeon. KE was the secondary surgeon. AV was responsible for manuscript editing and data collection and analysis. The senior surgeon does not receive royalties related to this device, although he is a paid consultant of Zimmer Biomet. Research was funded in part by Zimmer Biomet. This study received institutional review board approval from the local institution, Texas Health Resources, on April 19, 2017, reference # Pro1617 and was carried out in accordance with Good Clinical Practices (GCP) clinical guidelines.